Bare Feet and Feathers? 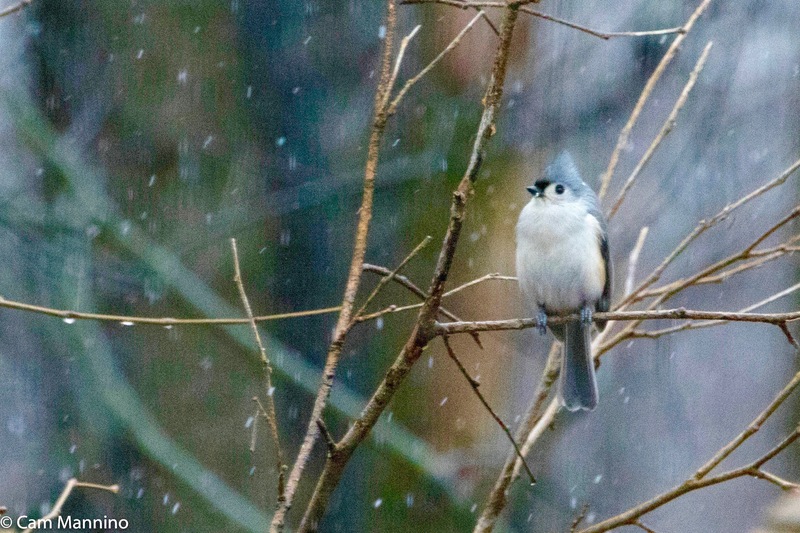 How Do Birds Survive Winter Weather? Well, it turns out that although our avian winter neighbors share a similar technique for keeping their feet from freezing, their strategies for dealing with cold, snowy days can differ. First Rule: Use Those Feathers! Male cardinal using the air between his feathers to stay warm. A Red-bellied Woodpecker looking very chubby on an ice cold morning. What About Those Bare Feet, Though? 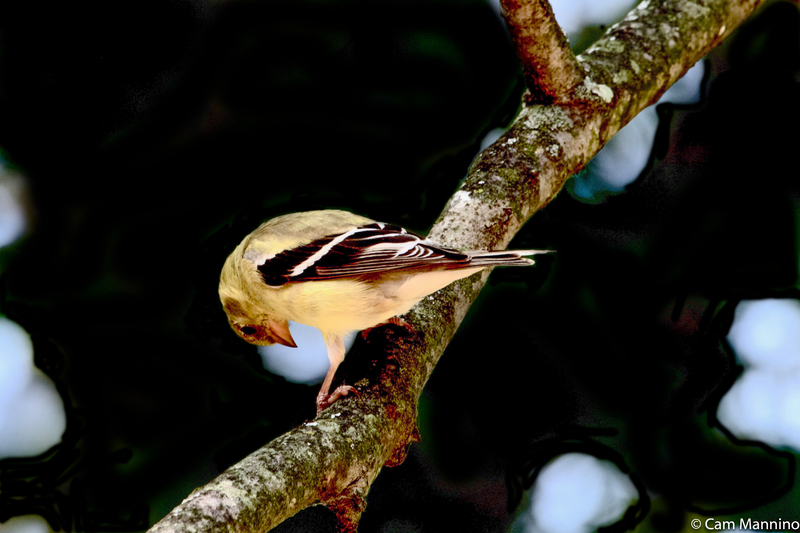 Last summer I caught this American Goldfinch (Spinus tristis) staring at its feet in a tree near Lost Lake. I laughed to think that perhaps it was worrying about how they’d feel on a snowy day! Birds really do have very cold feet in the winter. According to scientist and professor Bernd Heinrich on the Cornell website, the feet of chickadees stay just above freezing even while their body temperatures are very high. Presumably, they don’t feel it much. Their feet are mostly tendons and bones with very few muscles or nerves. If you look at those three birds with feather puffed that are pictured above, you can see they’ve hunched over their feet, covering them with their body feathers. Or sometimes birds simply tuck one leg at a time against their breast. Also, the arteries and veins in birds’ feet are close together. As Heinrich explains it, a bird’s feet are provided with continuous blood flow which keeps them from freezing. Since the arteries pass close to the veins in a bird’s legs, the cooled blood from the feet gets warmed on the way back to the heart to keep the bird’s body warm. And the warm blood from the heart is cooled down as it moves out to the legs, reducing heat loss. Pretty efficient system! Second Rule: Eat as Much as Possible! But What Do They Eat in Winter? Mourning Doves (Zenaida macroura) and American Goldfinches can be gluttonous at feeders during the winter because they are vegetarians; no insects or caterpillars for them! On most winter days, they can find seeds or fruits, but your feeder helps to supplement the wild supply. 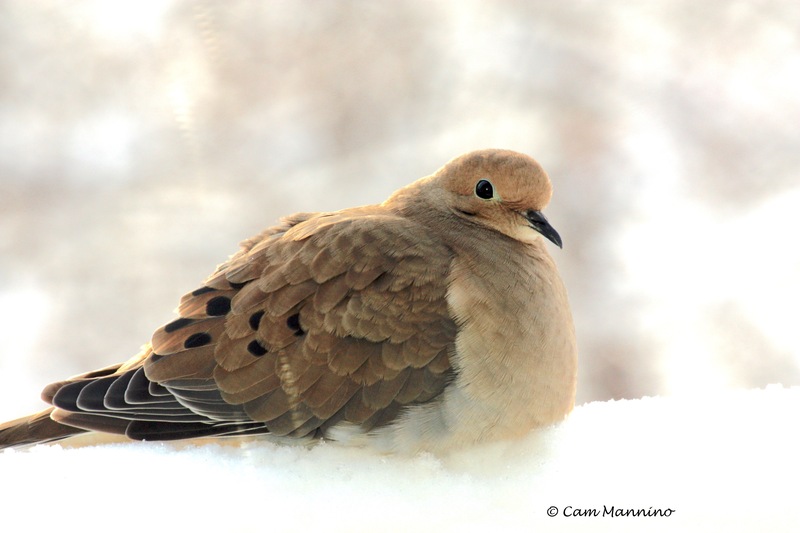 Mourning Doves can eat 12-20% of their body weight per day! They store seed in their crops, a muscular pouch near the throat, and digest it later to help keep themselves warm at night. Mourning Doves eat 12-20% of their body weight in seeds each day. I’ve seen Cedar Waxwings (Bombycillia cedrorum) eating frozen vine fruits or leaf buds that overwinter on the branches of trees. 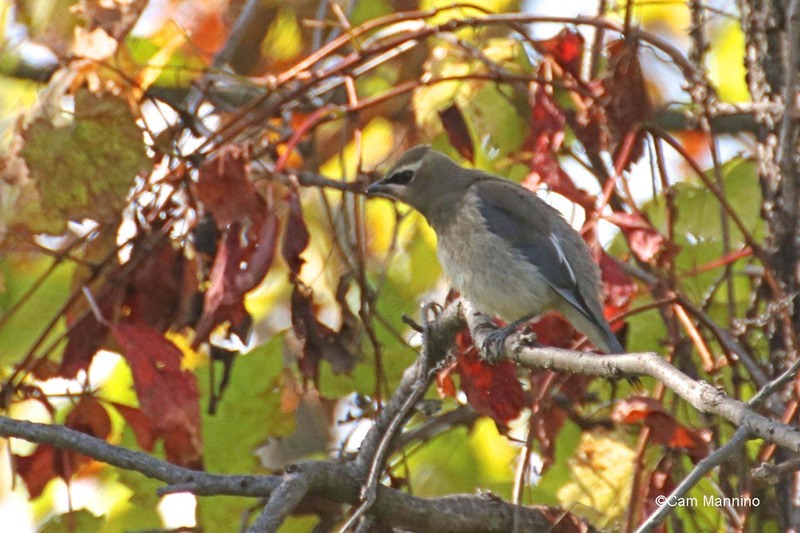 Cedar waxwings will eat leaf buds on trees during the winter as well as frozen berries. 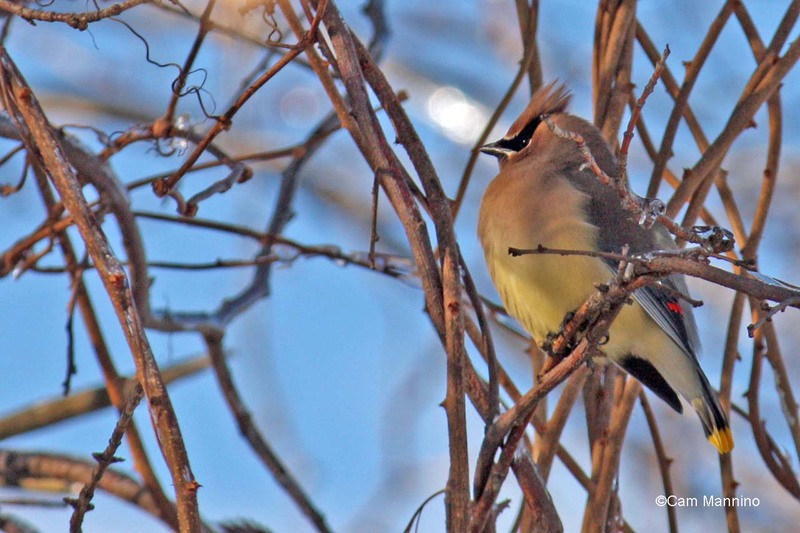 But many local birds, including Waxwings, are omnivores who can eat a wide range of foods. The Tufted Titmouse, White-Breasted Nuthatch, Chickadees and all kinds of Woodpeckers (family Picidae) spend winter days probing loose bark or hopping along branches looking for frozen dinners; insects, insect eggs, pupae or perhaps a frozen caterpillar will do just fine as sources of protein on a cold day. 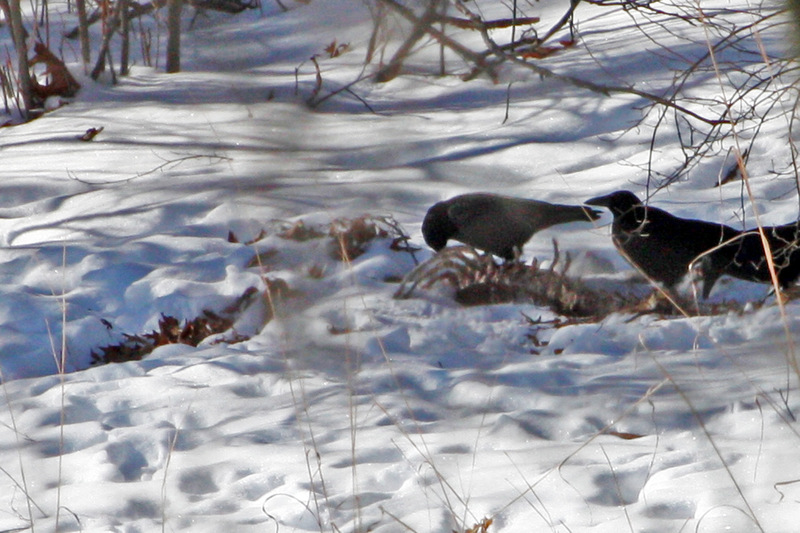 Crows find deer carcasses a great source of protein in cold weather. Where Do Birds Spend Cold Winter Nights? According to the Smithsonian’s Peter Marra, “Many small birds, like Black-Capped Chickadees, Eastern Bluebirds, and House Wrens, will gather in large groups at night and crowd together in a small, tight space to share body heat.” Sharing body heat keeps down fat loss during the night to preserve energy for the next day’s foraging. 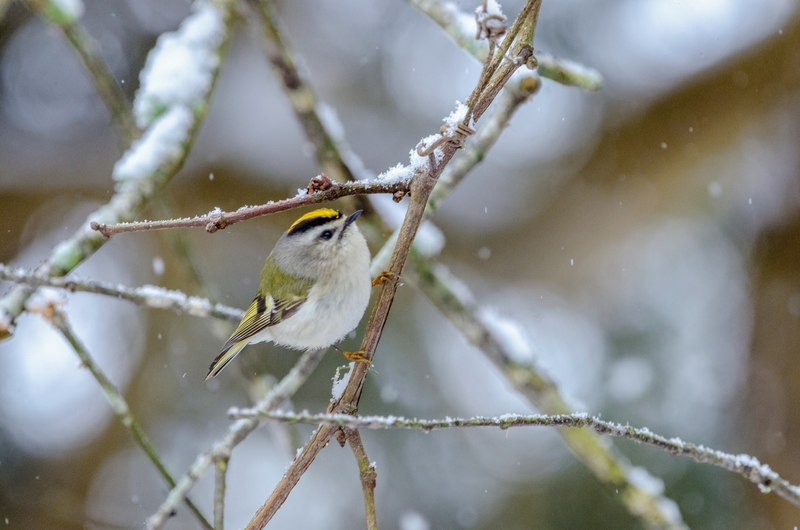 In his article for Cornell’s All About Birds, Bernd Heinrich describes finding a group of tiny Golden- Crowned Kinglets (Regulus satrapa) huddled in a circle on the branch of a pine tree, beaks in, tails out, sharing their body heat on a winter night. 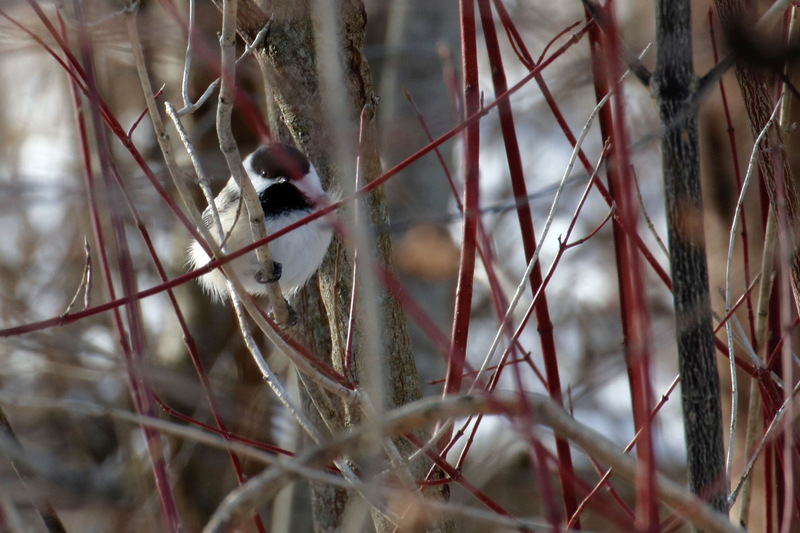 These tiny birds, which overwinter in our area, are about half the weight of a Chickadee! This lovely winter photo of a Golden-crowned Kinglet was taken by a photographer named cedimaria at the website inaturalist.org. Bernd Heinrich reports in his essay collection, Winter’s World, that woodpeckers provide some cozy winter housing for other birds as well as themselves. Every spring, woodpeckers make a fresh hole for raising their young, but they tend to use them for only one year. So small birds can often find an abandoned woodpecker hole to get out of the wind and snow on a winter night. In the autumn, Dr. Heinrich has also spotted both Downy Woodpeckers (Dryobates pubescens) and Hairy Woodpeckers (Dryobates villosus) constructing special overnight shelters just for winter use. 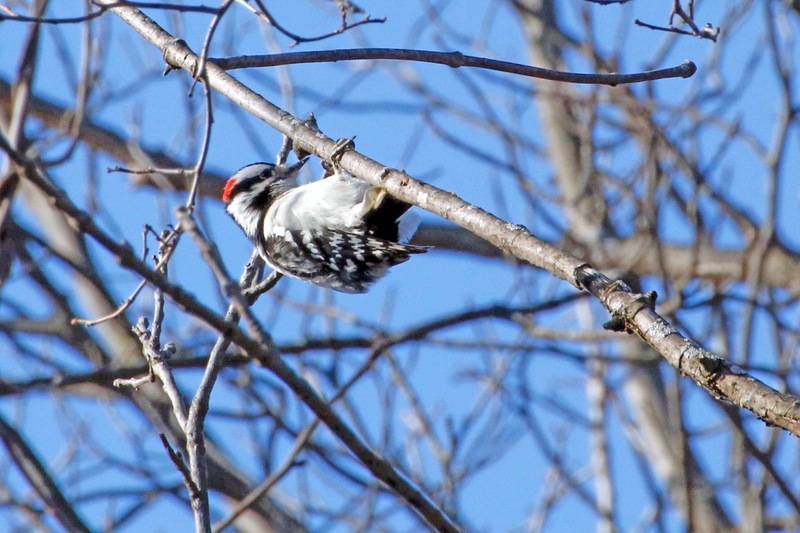 I spotted a Downy doing just that in Gallagher Creek Park one November day. Note the flying wood chips! A Downy woodpecker in November excavating a hole, chips flying. Even though Chickadees can excavate their own holes, in extreme cold they require a few extra tricks at night. According to the Audubon society, these little birds can lower their body temperature at night by as much as 22 degrees, minimizing the difference between their body temperature and the bitterly cold air. They also keep warmer by shivering, which activates opposing muscle groups and produces heat. Luckily, they can even shiver while sleeping, which is something I can’t quite imagine doing! And of course once settled, like many birds, they can tuck their beaks and feet into their feathers to preserve heat as well. 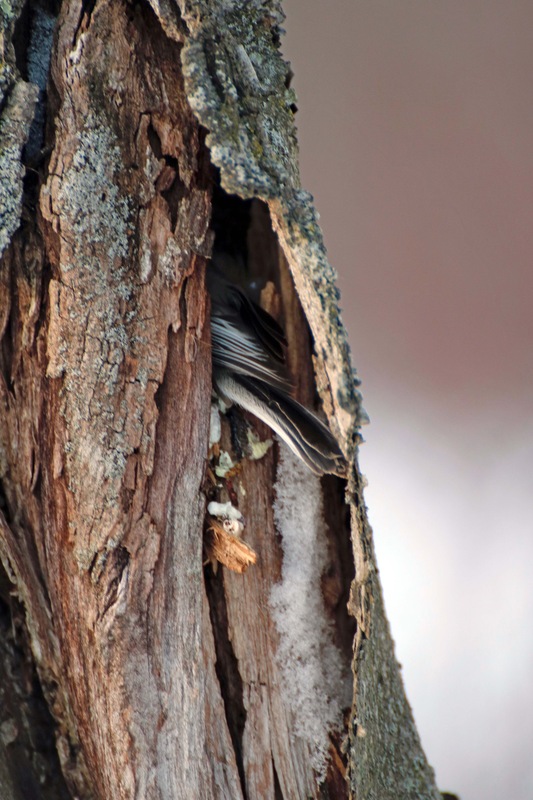 Though Chickadees can excavate their own holes , sometimes they explore an available cranny in a snag as a possible place to spend a cold night. Thank Goodness for Our Adaptable Winter Birds! A Chickadee plumped up and ready for a winter day. Aren’t you glad that some birds stay with us all winter? And that some actually arrive for an extended stay just as the snow begins to fall? 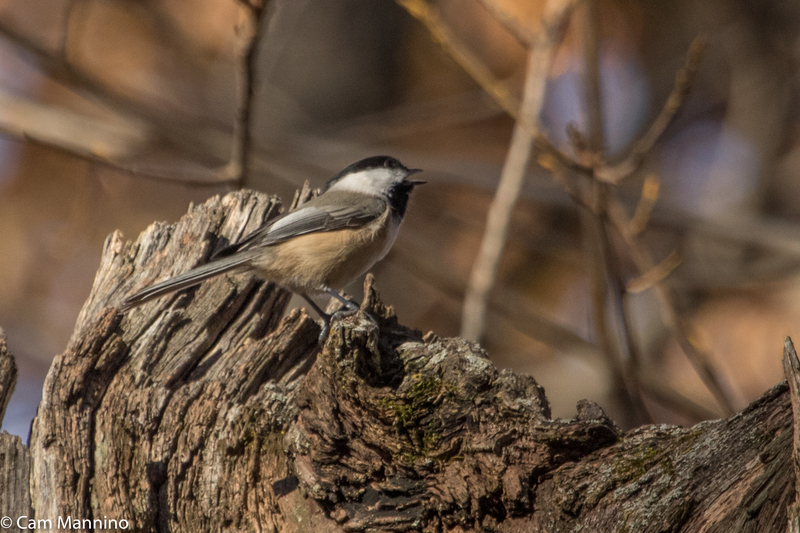 The constant flutter of a busy Chickadee, the “yank yank” call of a Nuthatch as it circles a branch or the friendly chirping of a flock of foraging Tree Sparrows in dry grass are so companionable on gray winter days. 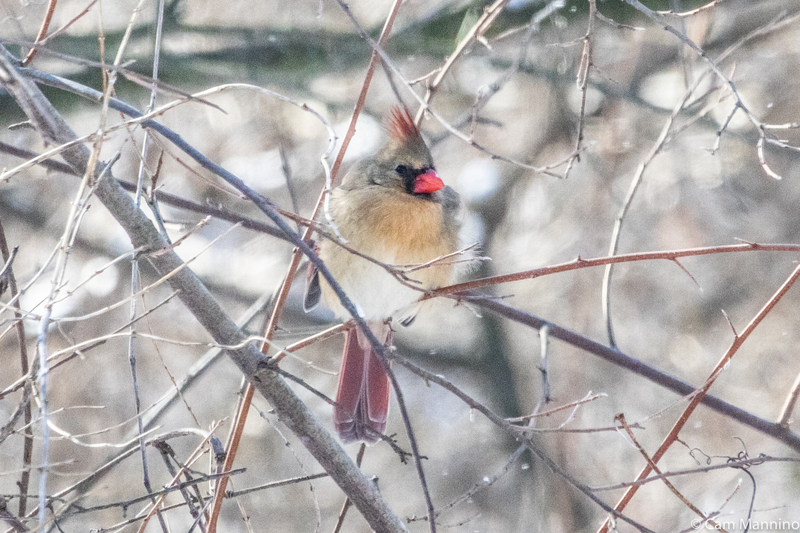 And what could be more heartening on a frigid morning than the sight of scarlet Northern Cardinals or azure Blue Jays in a snowy bush? I’m so thankful that some birds have figured out how to survive the cold along with us. By taking shelter, shivering, eating heartily, and snuggling into down comforters very much like we do, they keep us company as we make our way towards spring. Footnote: My sources for information, besides Oakland Township’s Stewardship Manager Ben VanderWeide, are as follows: Allaboutbirds.org, the website of the Cornell Lab of Ornithology at Cornell University; Wikipedia; A Field Guide to Nature in Winter by Donald Stokes, Winter World by Bernd Heinrich, A Naturalist at Large by Bernd Heinrich and others as cited in the text. PHOTOS OF THE WEEK: Amazing Migrators on the Move! Well, they’re off! When the wind sails in from the north, it’s a signal to all kinds of creatures: “Time to go!” So they take wing singly and in large flocks, letting the flow of cool air support them, carrying them quickly onward as they beat wings of all sizes to make their way to warmer climes. And of course, it’s not just birds. 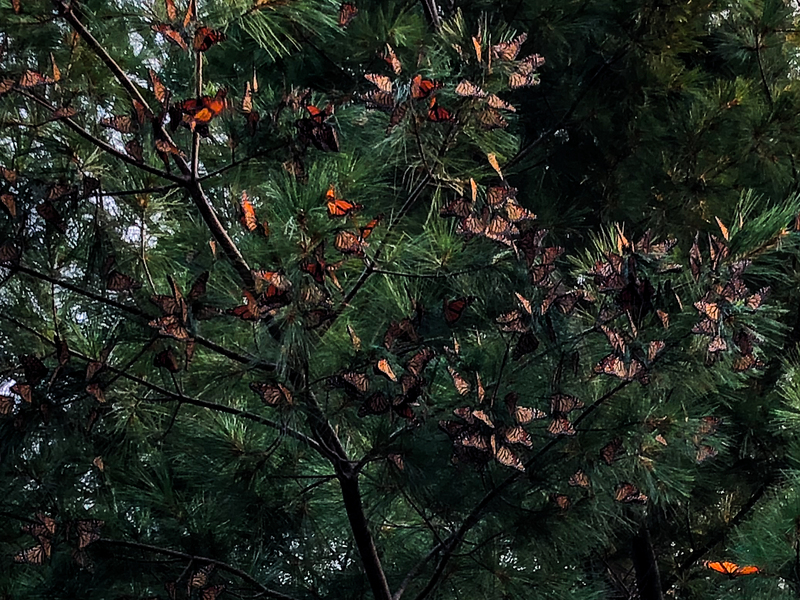 Above you can see our friend Nancy Isken’s photo of Monarch Butterflies (Danaus plexippus) last week resting at Tawas Point State Park before crossing Saginaw Bay. They were beginning their long journey to Mexico where they will spend the winter. In the spring, these Monarchs will make the first leg of the journey back north, stopping in warm areas like Texas to produce a new crop of butterflies who continue heading north. These new generations will fly only a few hundred miles, stop and reproduce, completing their whole life cycle in only 5-7 weeks. So it takes several generations to complete the trip back to Michigan each summer. 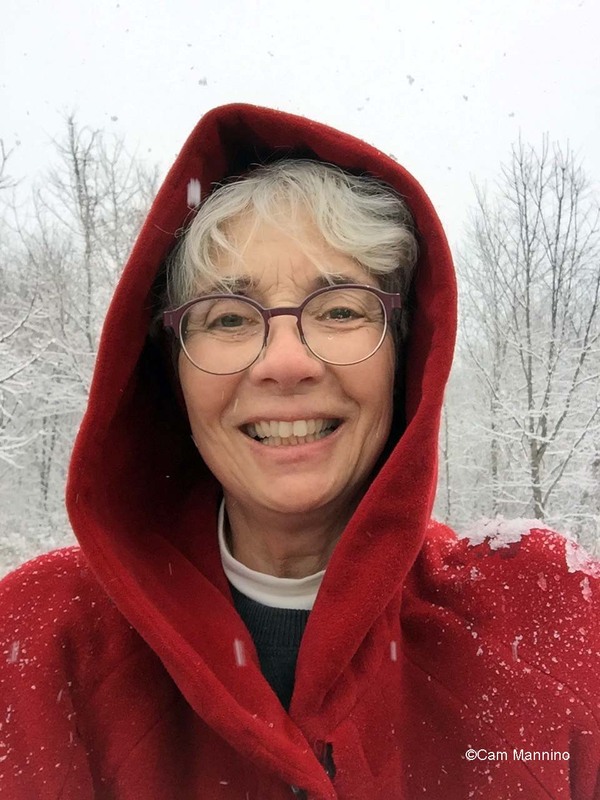 Sarina Jepson of the Xerces Society, which is focused on invertebrate conservation, says in a fine National Geographic article, “…when fall rolls around again, a special ‘super generation’ of monarchs that can live up to eight months will make use of air currents to wing all the way back to Mexico—a seemingly impossible feat for such a delicate-looking insect.” Imagine that! So the Monarch butterflies born here In Oakland Township each summer can potentially live for 8 months instead of 5-7 weeks and fly 3,000 miles instead of a few hundred. We are living among real, live superheroes! And Monarchs aren’t the only insects that migrate. Green Darner Dragonflies (Anax junius) (also tracked by the Xerces Society) travel down to Texas and Mexico as well. For dragonflies, it also takes many generations of reproduction before their trip is completed, though their migration is less well understood. But again, like the Monarch generations that arrive here each summer, the dragonfly offspring seem to know how to find their way in the right direction. 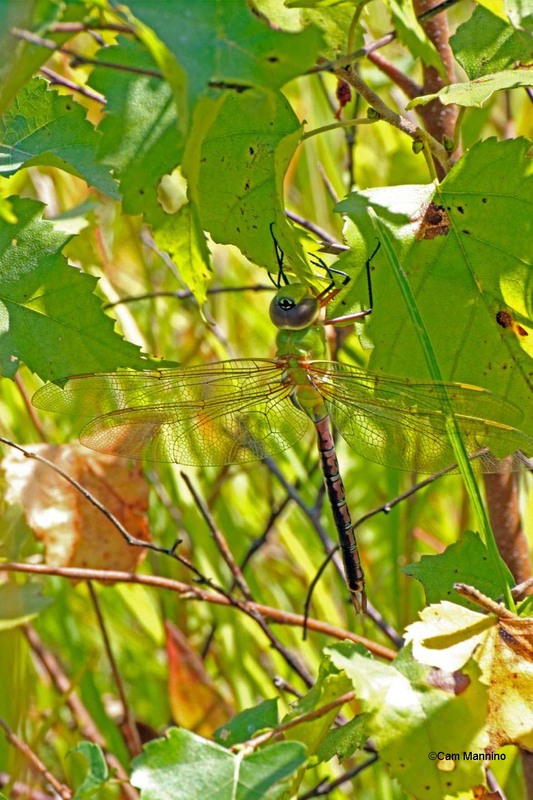 Citizen science and research is helping explore dragonfly migration. But for now, I love a good nature mystery, don’t you? 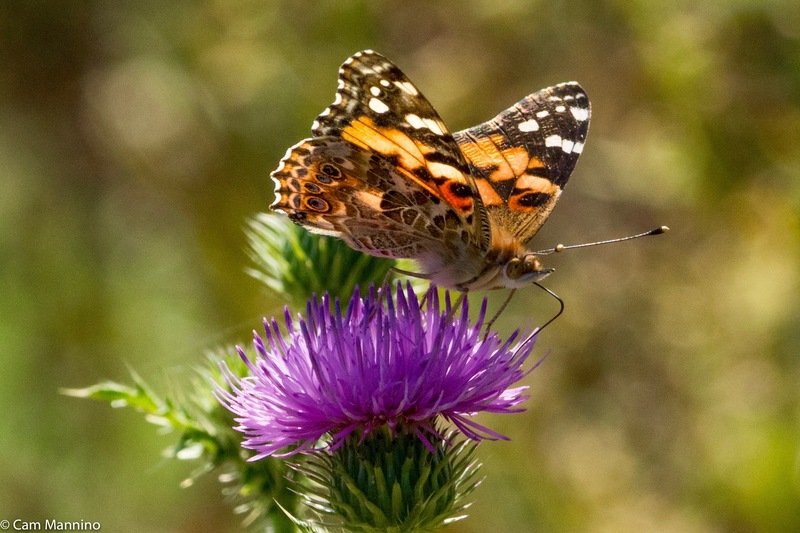 Painted Lady butterflies (Vanessa cardui) make multiple generation migrations all over the world. But they migrate erratically. Some years they migrate and some years they don’t. And the direction and route can vary widely. Some experts speculate that their migration routes may be affected by dramatic changes in weather and climate – another nature mystery yet to be solved. At this time of year, the night sky begins to fill with thousands, even millions, of birds riding the wind south in the darkness, navigating by the stars or the setting sun, or by sensing the earth’s magnetic field. Some may navigate by landmarks or simply remembering good feeding grounds. And amazingly, most juvenile migrating birds, like those insects hatching during migration, somehow know how to find their way without any help from adults! Cornell’s BirdCast website is a great way to watch the flow of birds across the United States day by day throughout the fall. If you’re thinking you’d like to see some bird migrations in BIG numbers, you might check out the Hawk Fest featuring hawks, eagles, falcons and owls at Lake Erie Metropark on September 15 and 16. Or if you love our Sandhill Cranes (Grus canadensis), consider a trip to the Audubon Society’s Cranefest at Big Marsh Lake in Bellevue, Michigan (near Battle Creek) on October 13 and 14. 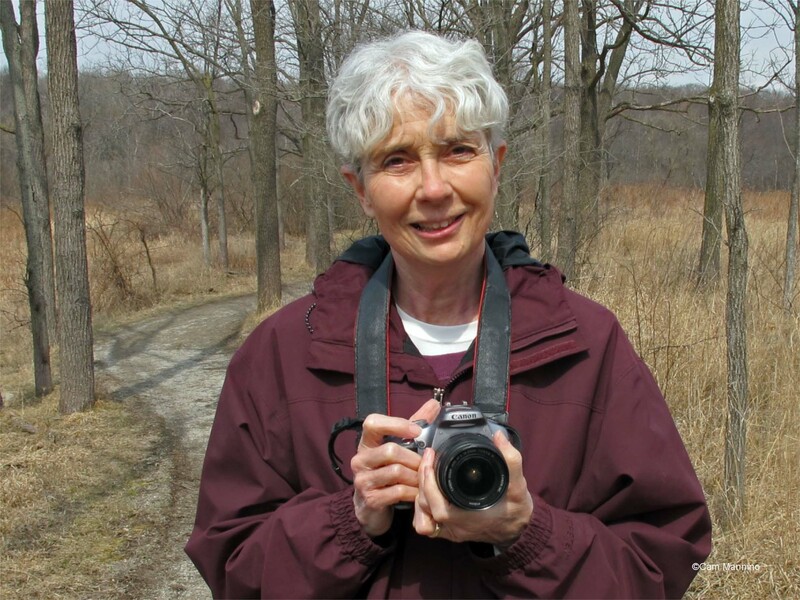 Of course, if you want to stay close to home, you’ll be warmly welcomed at our Oakland Township Wednesday morning bird walks. 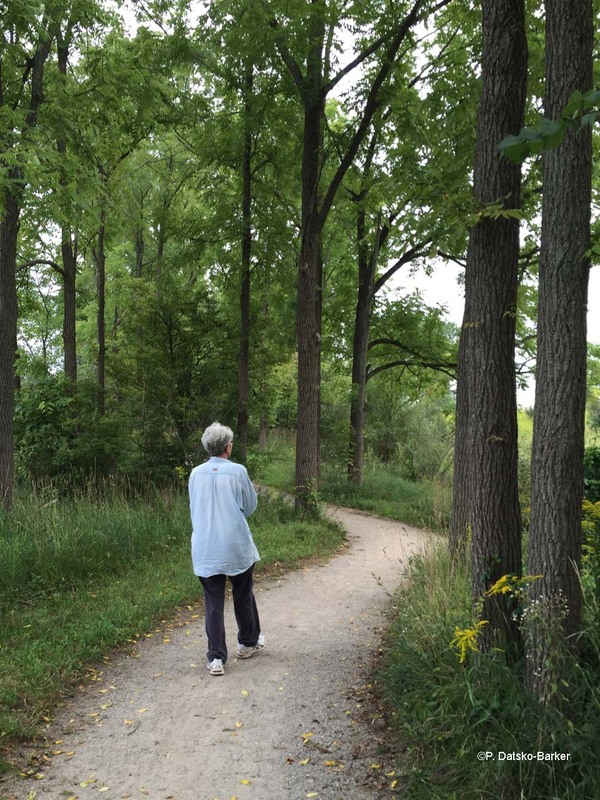 The walks rotate through our township parks each month and in September and October, they start at 8 a.m. The schedule is available year ’round if you click on the drop-down menu above for “Stewardship Events.” We’re a friendly group with some experienced birders who are glad to help beginners see their first migrators. Bring your binoculars or borrow a set from Ben, our Natural Areas Stewardship Manager, who leads the walks. So yes, summer is waning. But I can’t help feeling celebratory as autumn air turns crisp and the skies fill with winged creatures. 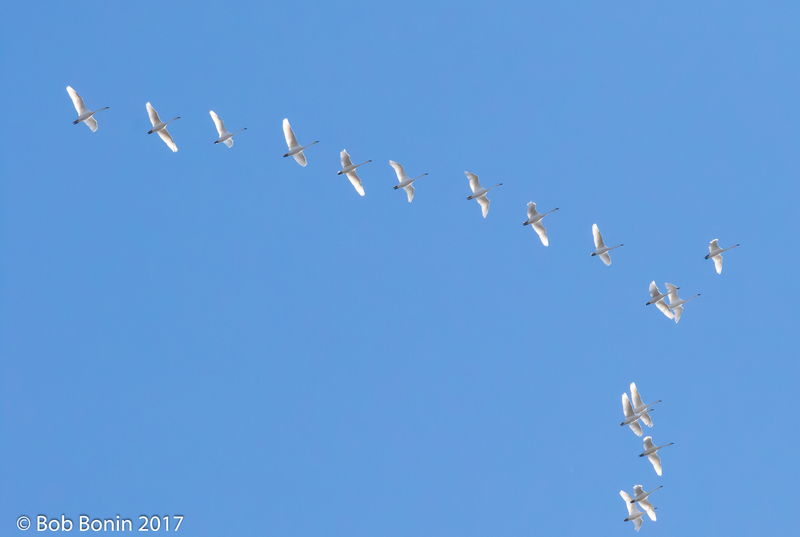 I recommend looking upward this fall and perhaps wishing “Bon Voyage!”, to our migrators who provide such beauty and mystery as they find their paths through the air. Oakland Township is honored to have royalty stop by on their way to the north country! No entourage for this group, though the paparazzi do follow them avidly, as you’ll see below. Like many royals nowadays, they mostly look ordinary. But once in a while, if you’re lucky, each of them don their extravagant gold and ruby crowns – especially when courting their royal consorts or battling over territory. As you may have guessed, I’m referring to two kinglets, those tiny avian migrators who, when excited, raise their brightly colored crests. 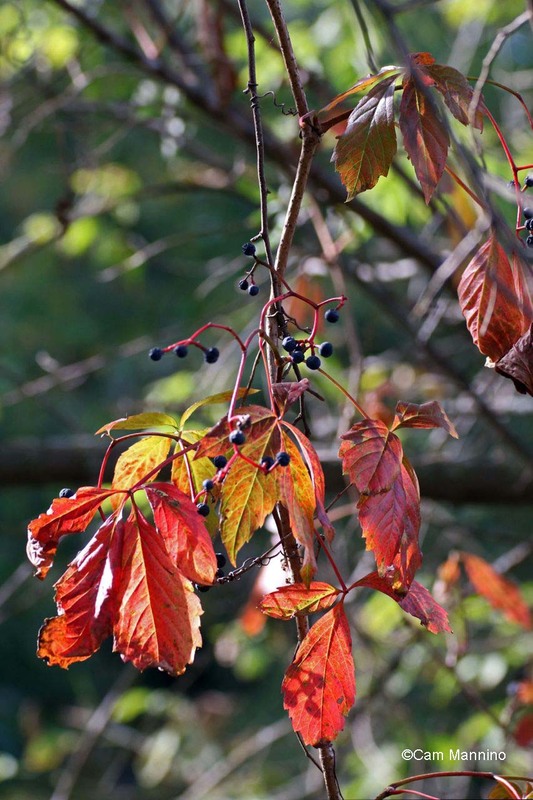 In the last two weeks, both little “crowned heads” of North America paused in their northern sojourn to enjoy a brief respite among the trees of Charles Ilsley Park. Most of the time, the Ruby-crowned Kinglet (Regulus calendula) is an unassuming green-gray bird with a white eye-ring. It hops at a frenetic pace from limb to limb, tree to tree, twitching its wings, and moving on. Here’s a Ruby-crowned Kinglet in its humble garb at Ilsley last week. But when agitated, this diminutive monarch pops up a bright scarlet crest. Unfortunately all of the Ruby-crowns I’ve seen have been reluctant to display their crowns for me. 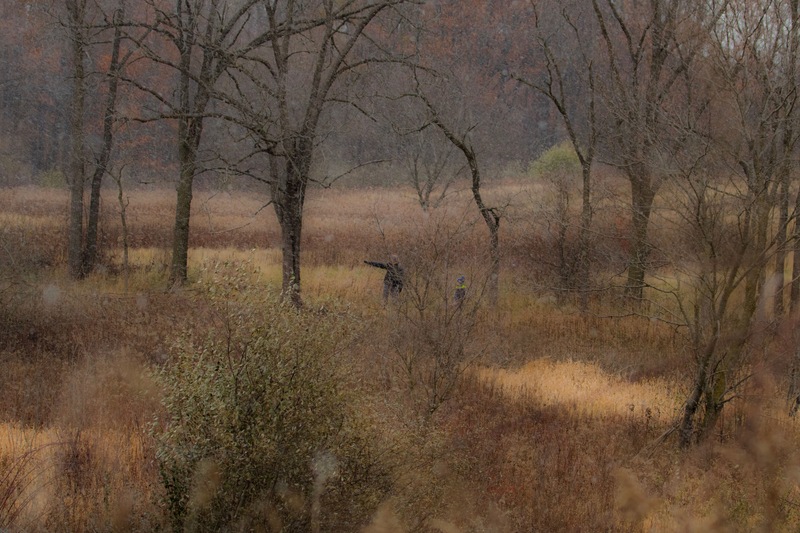 So, here’s a photo of one doing just that, taken by Mathesant, a talented photographer at inaturalist.org. 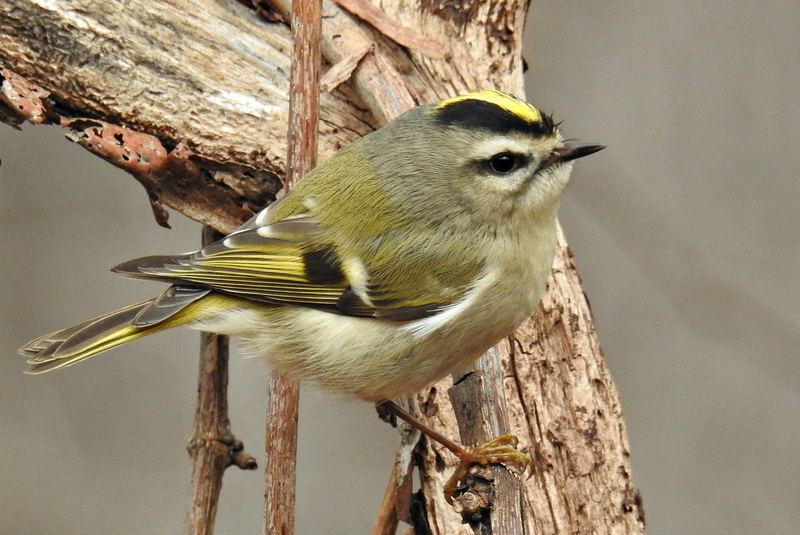 On a cold April morning, the birders spotted another royal migrator, the Golden-crowned Kinglet (Regulus satrapa). Since this one preferred to stay high in the treetops, taking his portrait at Ilsley on a gray day was a bit challenging – but at least we were able to admire that bright yellow head stripe from a distance. These little birds (smaller than a chickadee!) keep a patch of orange/red feathers hidden beneath that stripe. This tiny kinglet also only flaunts his splendid crown when he’s really excited. I couldn’t find a photo of the raised crest that I could share here. But it’s pretty impressive, so catch a glimpse at this Cornell link instead. These two aerial royals only grace our parks on their way to the dense spruce or fir forests to the north, the summer retreats where they raise their offspring. So be on the lookout right now for royalty in the tree tops! 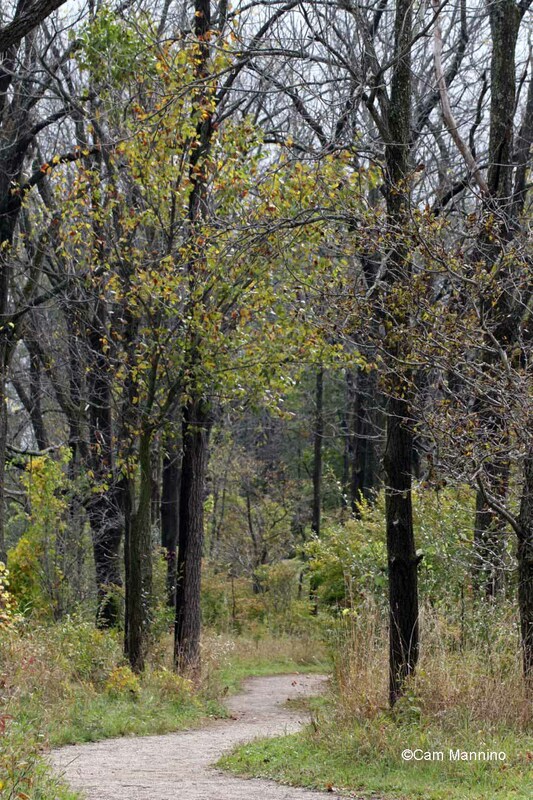 At first glance, Bear Creek Nature Park in November doesn’t have much to recommend it. A frequently gray sky glowers overhead. Insects don’t buzz, soar over or spring out of the fields now drained of color. Birds only occasionally call but never sing. A casual observer might say that that there’s “nothing to see.” But they’d be wrong. It just takes a bit more attention and a dash of memory to enjoy a late autumn hike. That quick little movement in the bare shrubbery could be a group of small golden migrators wintering here with us. 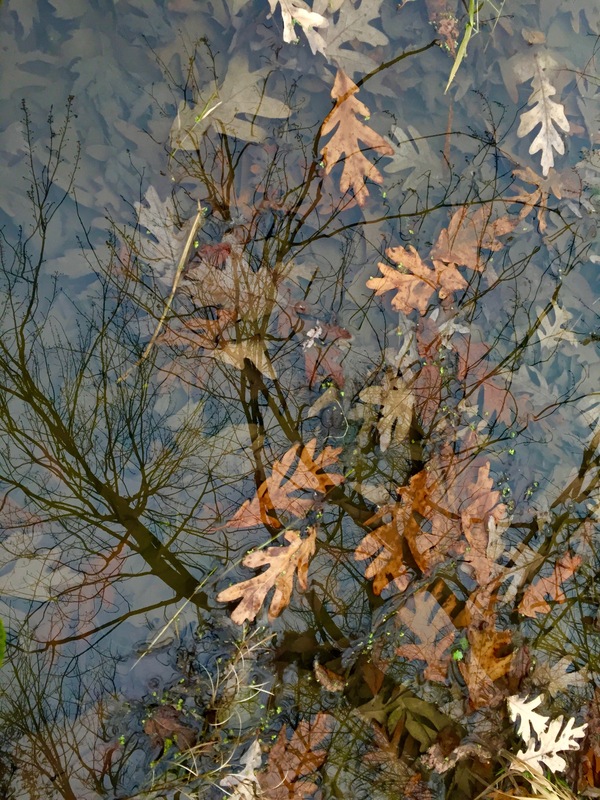 Leaves skate across the pond’s first skim of ice or frame a bit of brilliant green and red moss. The birds that live with us year ’round are making winter homes and energetically seeking out bits of nourishment all around us if we look. Summer creatures snooze under the bark of trees and under the soil at our feet as we walk. Life doesn’t stop, even in November. We just need a bit more care to enjoy it on a November day. 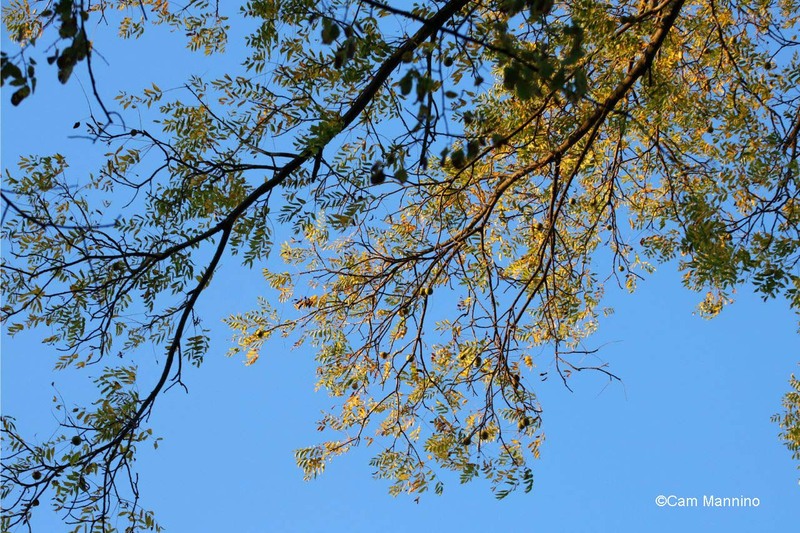 Noticing November’s Birds – Blue, Red, Golden, Even Ones with Fancy Hairdos! All month the Center Pond has shifted from water to ice and back again – but it’s always a place to watch with a keen eye. On the first bird walk of the month, the group saw Mallards (Anas platyrhynchos) as usual, calmly cruising at the far end of the pond. But then, wait! What about that bird with the bouffant crest? It seems that those sneaky Hooded Mergansers (Lophodytes cucullatus) may have added an egg to a Mallard or Wood Duck nest, as they occasionally do. The young female Merganser steamed up and down the bank at a snappy pace, as her Mallard companions paused to preen along the way. This female may have come from an egg that the adult laid in a Mallard or Wood Duck nest. That same early November day, the birders heard the “tsee, tsee” call and then saw a group of winter visitors from northern Canada, Golden-crowned Kinglets (Regulus satrapa). The flock was too quick-moving for me, so I’ve borrowed a lovely shot from iNaturalist.org’s photographer, Joanne Redwood. Though we saw these little Kinglets in bare shrubs, look for them mostly where there are lots of pines whose needles provide shelter for them on snowy days. Late in the month, a male Belted Kingfisher (Megaceryle alcyon) had claimed the center pond as his winter territory and found my presence quite annoying. When I spotted this guy, he was calmly gazing out across the pond with his crest lowered. But as I approached, his crest began to rise as he swooped between three trees at the eastern end of the pond, shouting his rattle-call to declare his territory. Female Belted Kingfishers usually migrate a bit south to be guaranteed some open water, which they need for fishing. But the males often stay north to protect possible nesting territory. When the pond freezes, though, he’ll temporarily move south or to water that stays open in the dead of winter. 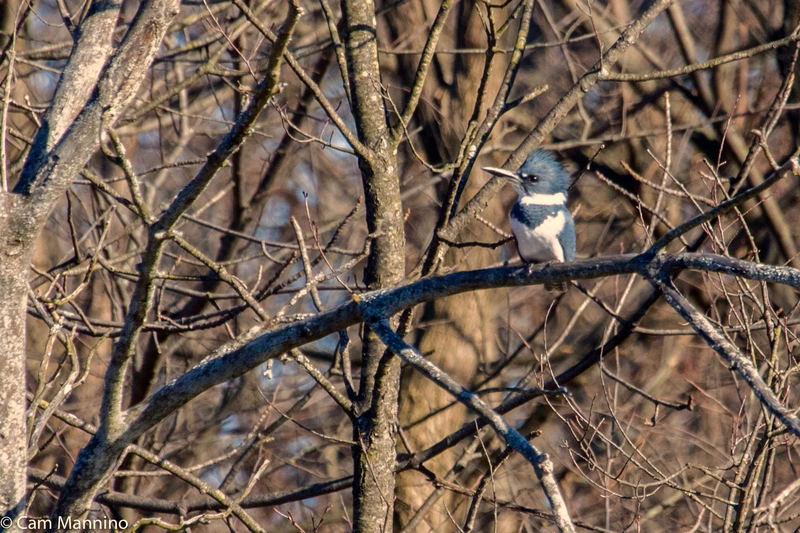 An agitated male Belted Kingfisher pauses for a shot as he defines his territory for me by swooping between 3 trees. The next time I saw the mallards at the pond, the day was icy cold but the pond was still open. 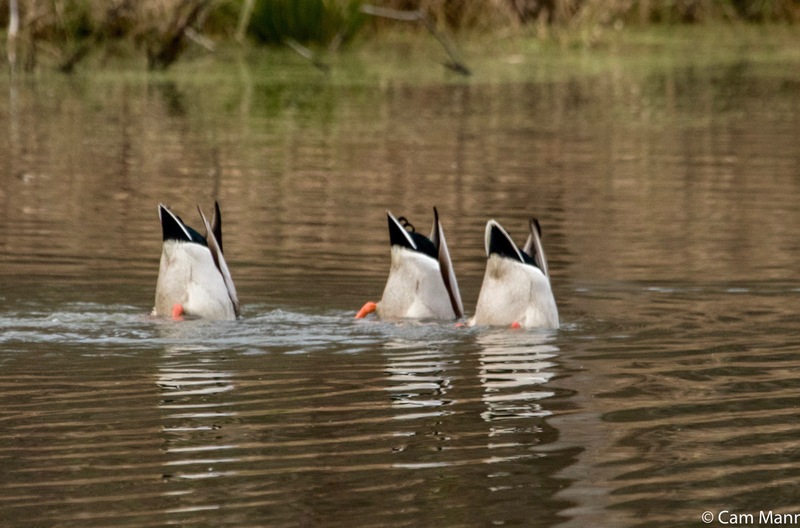 Three males were “bottoms up,” feeding. Three male Mallards go “up tails all” while feeding in the Center Pond. 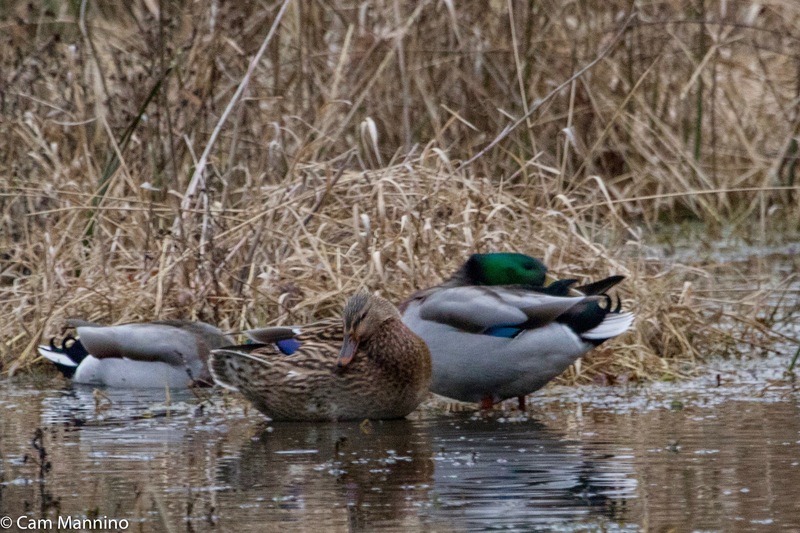 On that same icy day, a large flock of Mallards on Bear Creek Marsh preened frantically, trying to keep warm by adding oil to their feathers from a gland beneath their tails. The oil helps align their feathers, providing maximum waterproofing and insulation. 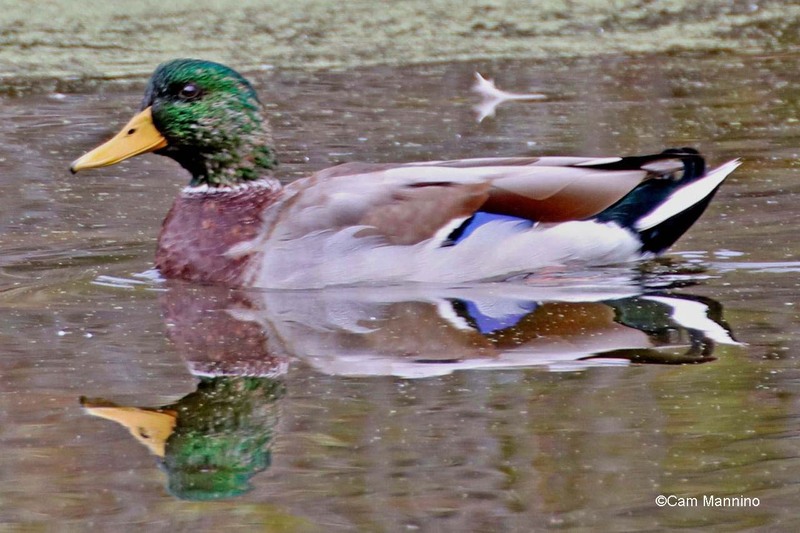 On any icy day, Mallards in the marsh preen busily, adding more oil to their feathers for insulation and waterproofing. A female Bluebird with her characterisitc gray head. She looked at me with some curiosity as I looked at her in the same way. The number of “dees” in the call of Black-capped Chickadee indicates how much danger it perceives. 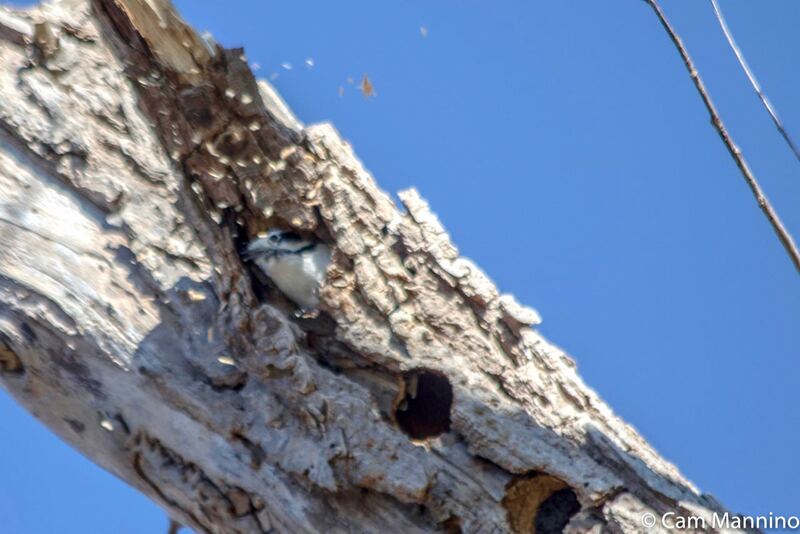 A few minutes later, a White-breasted Nuthatch (Sitta carolinensis) decided to take it step further – either looking for possible insect eggs or perhaps exploring the depth of a hole in the same snag for a winter retreat. 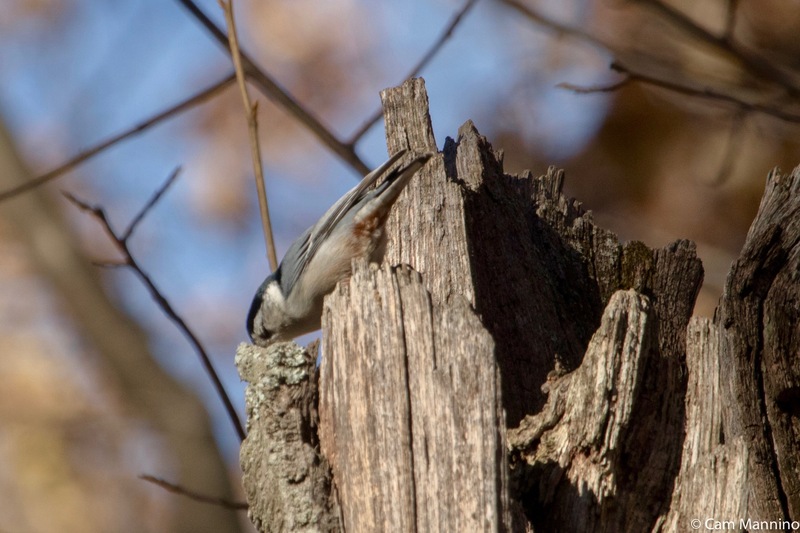 In winter, Nuthatches hang out with Chickadees and Titmice for protection and to take advantage of possible food sources other birds may find. A White-breasted Nuthatch explores a hole in the same snag graced by the Chickadee a few minutes before. A “kwirr” call from high above alerted us to a Red-bellied Woodpecker (Melanerpes carolinus). This male definitely seemed to be foraging. I think I spotted little insect eggs on his beak as he concentrated his attention on one spot in the bark. He can use his summer nesting hole in a dead tree or limb on cold winter nights. On days when birds are elusive and the parks seem quiet, I watch for reminders of summer creatures who are hidden away, spending the winter underground, under water, or under bark and leaves all around me. Here are a few that came to mind during November. The Raccoon’s (Procyon lotor) hole is empty now, but I bet there may be one or two sleeping deep in that well-used south-facing hole. The empty raccoon hole looks forlorn. But one of two raccoons may be curled up down below. It looks as though a Muskrat (Ondatra zibethicus) built this unusual “push-up” den among the trees on a small mud flat in the Center Pond. So there will be probably be one swimming very slowly and eating in the air space inside the den during the winter. Muskrats spend the winter slowly swimming and feeding under the ice and resting in the airspace of their dens. Of course, some of the reminders concern summer visitors. This little nest we spotted during an early snow shower could be the summer breeding home of a variety of birds. I’m no expert on nests, but I’m imagining that it could be that of a Chipping Sparrow since Cornell describes their nests as “a loose cup of rootlets and dried grasses so flimsy you can often see through it” But that’s just a guess. A small nest appeared on a snowy day. Perhaps it’s the nest of a Chipping Sparrow. But that’s only a guess. And this fragile, scrap of nest near the pond brings back memories of the faithful father, the Rose-breasted Grosbeak (Pheucticus ludovicianus) who patiently took his turn at the nest – an unusual behavior in male birds. The nest was never very sturdy but autumn winds and rain have left only the base. The remains of the Rose-breasted Grosbeak’s nest near the pond. The faithful male Rose-breasted Grosbeak takes his turn on the nest at Bear Creek Nature Park. And this abandoned, tattered masterpiece was probably the home of some sort of Yellow Jacket species, perhaps the Bald-Faced Hornet (Dolichovespula maculata.) The only surviving member of this once active hive would be the inseminated queen who is probably spending the winter under bark or inside a log nearby. She’ll emerge to lay the eggs of future queens and future workers whose infertile eggs produce the males. A Bald-faced hornet landing on a nest in the summer. Standing by a wetland pond in the park last week, I was reminded of the Salamanders (Order Urodela) who now must be hibernating under my feet. On a warm, wet night next spring, salamanders will wriggle their way to the water, lay their eggs on a stick and hide again under logs further upland. That’s where I found some of their young when the trees were green last spring. The Mourning Cloak butterfly (Nymphalis antiopa) which can actually overwinter as an adult under bark or in a tree cavity might be camouflaged inside or on any tree you pass on your hike. The underside of it wings imitate tree bark when folded. The upper side, however, features a white edge and a lovely band of blue spots when it flutters forth in early April, as you can see in this photo by inaturalist.org photographer Lewnanny Richardson. How about placing bets on which leaf wins the race across an icy Center Pond? Here’s a silly 10 second video with faint “play-by-play” by my husband, Reg. And adult and child venturing out on the Walnut Lane. Footnote: My sources for information, besides Oakland Township's Stewardship Manager Ben VanderWeide, are as follows: Caterpillars of Eastern North America by David L. Wagner; inaturalist.org;Allaboutbirds.org, the website of the Cornell Ornithology Lab at Cornell University; Wikipedia; Herbarium of the University of Michigan at michiganflora.net; various Michigan Field Guides by Stan Tekiela;Butterflies of Michigan Field Guide by Jaret C. Daniels,  and others as cited in the text. What a glorious week for seeing migrating songbirds – and what frustration for a photographer who can’t quite manage to capture them all! The trees, bushes and vines (like the Virginia Creeper on the right) are full of tiny, chirping birds that hop about quickly searching for sustenance before the next leg of their fall journeys. I’ll share what I was able to photograph this week, with all the imperfections of an amateur photographer who, until this year, had almost no experience with warblers – who are very small and move very fast! And then I’ll link you to better photos from Cornell Lab or Audubon.org, so you can see these little beauties up close – instead of half hidden by brush, silhouetted against the sun or at the very tops of trees! So much color and energy in the park! It’s a wonder how these small songbirds sail through the night and land in Bear Creek for a day’s rest and some fruits, seeds and insects to sustain them on the next leg of their journeys. Winged Visitors : Warblers and Kinglets Everywhere! If you’re looking for small migrating birds at Bear Creek, bring good binoculars and a lot of patience! 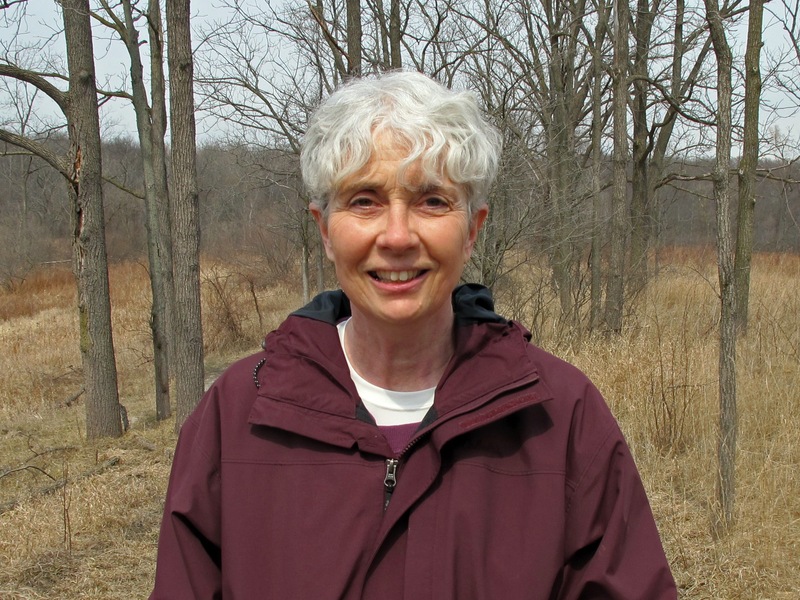 I learned a lot at Wednesday’s bird walk from Dr. Ben and Ruth Glass who leads bird walks at Stoney Creek Metro Park and is a highly experienced birder. For instance, they told us that in early morning, it’s best to look for birds where the sun first hits the trees. (Makes sense, eh?) So take the path into the park from Snell and once you get out in the field, look in the trees and bushes at the first large curve to the left. Wow! Lots of birds in those bushes and trees! Other great places for me have been the Walnut Lane and the circuit all the way around the Playground Pond. Walk slowly and very quietly and begin by listening to any cheeping in the bushes. Watch for twitching foliage and you’ll see them. But you need to go soon! The migration for many songbirds peaked this week and numbers will decline until they are gone by early November. 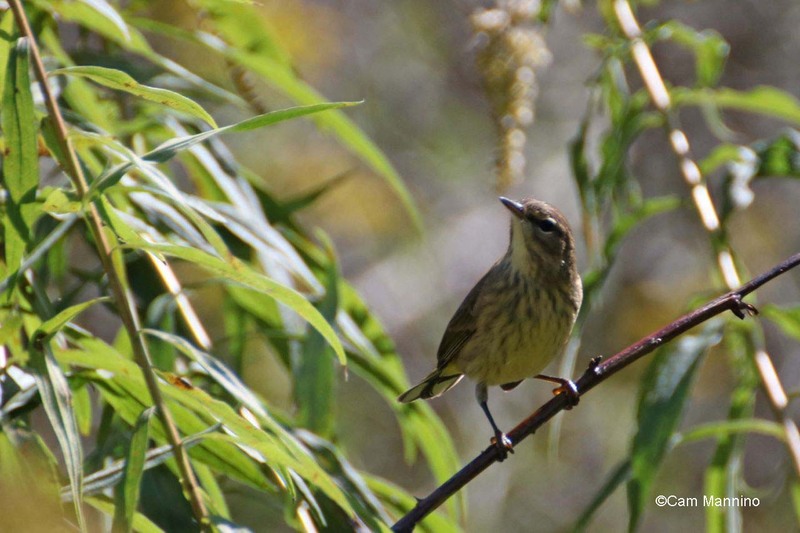 Palm Warblers (Setophaga palmarum) hopped from branch to branch again this week. Look for their “field marks,” including a rusty cap, dark eye line, breast streaks at the sides and yellow underparts. It’ll be leaving soon to go as far south as the Caribbean – which could be where it got its name? Palm Warblers are passing through the park. Look for their yellow underparts with streaking on the side and a rusty cap. I caught sight of what I think is a Tennessee Warbler (Oreothlypis peregrina) going after some fruit. It seems to be a male in its non-breeding, fall colors. Page down to the bottom of this link for several different good views, including the non-breeding (fall) plumage. Side note: Last week’s Nashville Warbler (Oreothlypis ruficapilla) and this one aren’t necessarily from Tennessee. According to Ruth Glass, they were first reported and drawn by John James Audubon who lived in Kentucky for part of his life and probably named birds for where he saw them. 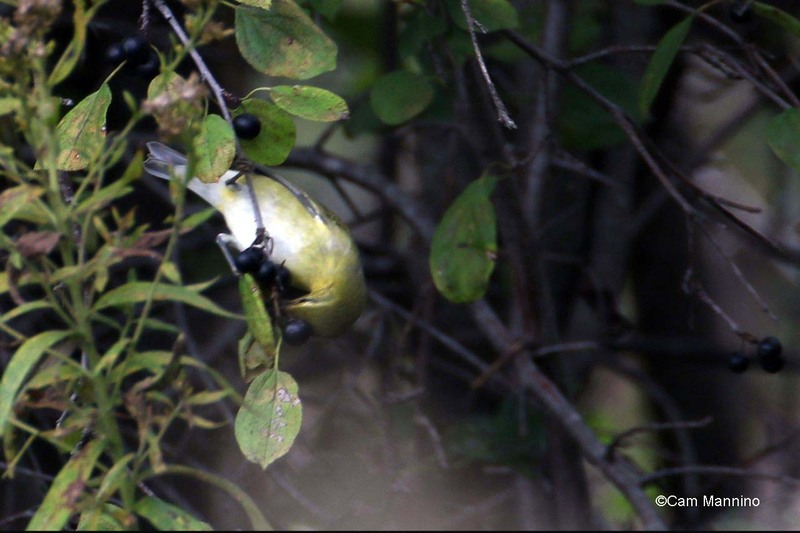 A Tennessee Warbler forages for fruit before continuing its migration. The tiny, almost constantly moving Kinglets pass through Bear Creek during the spring and fall, too. The flitting Ruby-Crowned Kinglet is identified by its size, irregular white eye ring and its twitching wings! 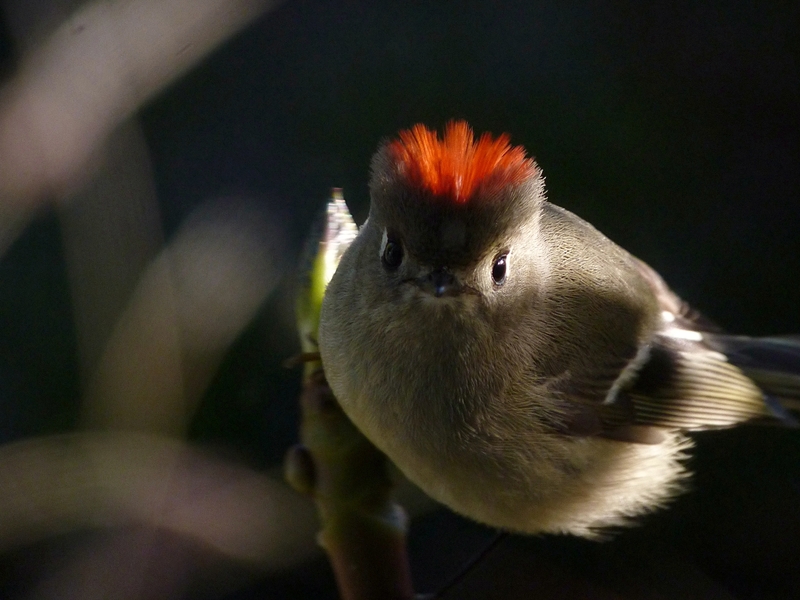 Its “ruby crown” only shows when it’s excited or courting, though one of the birders saw a Kinglet’s crown this Wednesday! Maybe you can see the tiny red dot on the head of this bird that I saw the next day – or you can have a look at it really flared in this Audubon link. 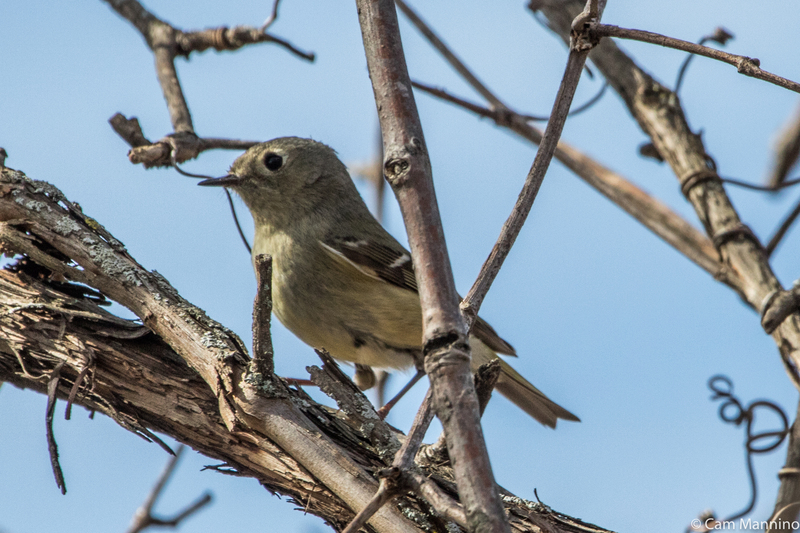 A tiny Ruby-Crowned Kinglet – see the link above for a photo with the crown flaring. 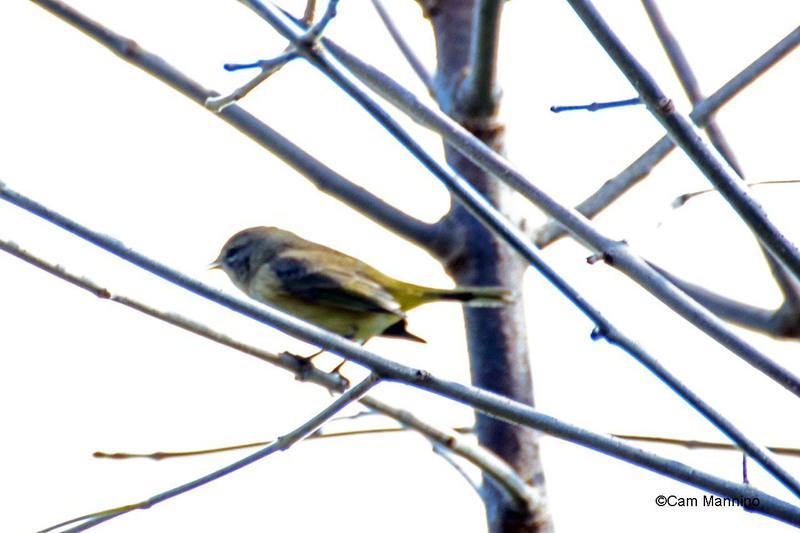 I saw another Kinglet last weekend silhouetted in the sunlight and had no idea what it was until Ruth Glass identified it from my poor photo as a Golden-Crowned Kinglet (Regulus satrapa.) Their field marks are a very short, thin beak perfect for winkling out insects and of course the gold on their wings and crown. Have a look at this Audubon link for a better view! 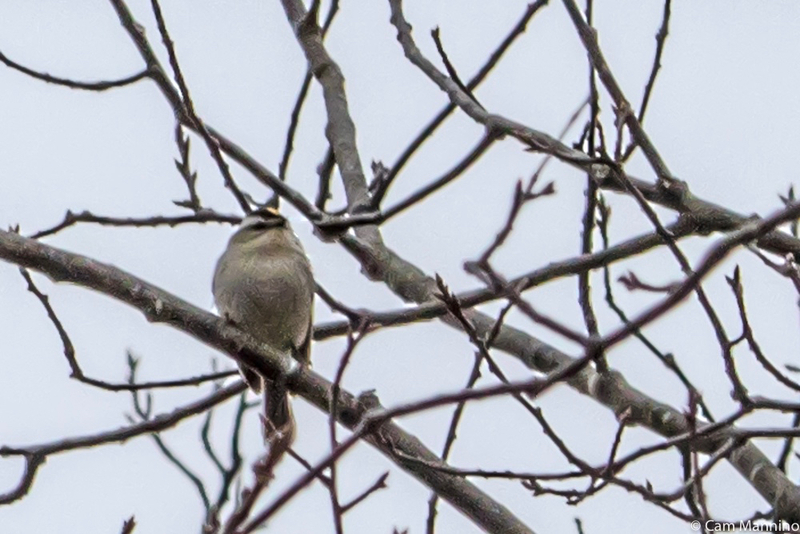 My not-so-terrific photo of a Golden-Crowned Kinglet. See the link for a much better photo! I learned this year to stop ignoring small, brownish birds assuming they were all sparrows that I already knew. That’s how I missed seeing other small migrants. 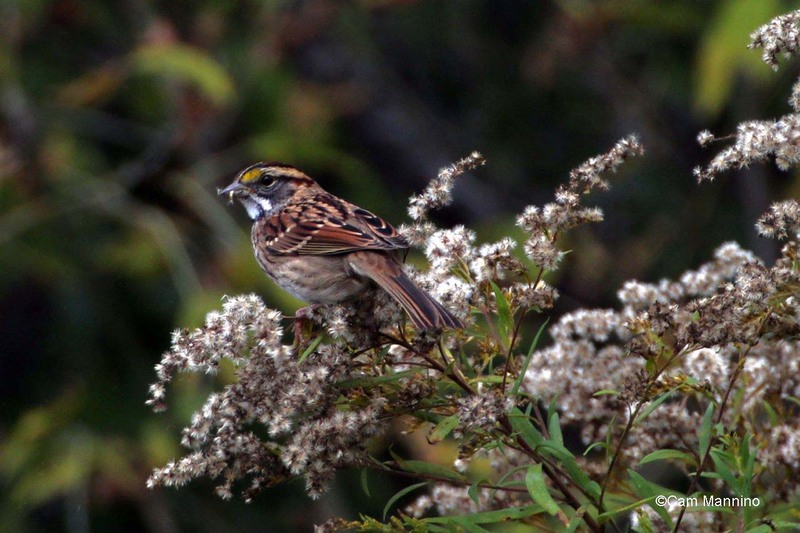 Look at this beautiful White-throated Sparrow (Zonotrichia albicollis) with the bright yellow dots(called “lores”) in front of its eyes, a striped crown and of course, a white throat marked by black stripes called “whiskers” or “malar stripes”! Keep an eye on sparrows! Here’s a migrating White-throated Sparrow with a bright yellow dot in front of his eyes. A White-Crowned Sparrow born this summer, readying itself for its first migration. White-Crowned Sparrows look radically different after one year. Here’s a photo I took at Bear Creek on October 6, 2008 and then a closeup of one at my house in spring a few years later. 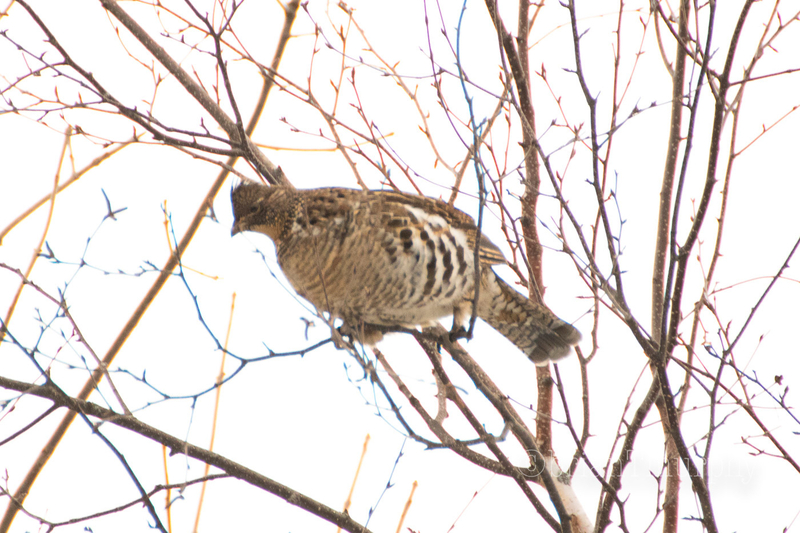 Hard to believe it’s the same bird as the brown “first winter” bird in the photo above, isn’t it? A White-crowned Sparrow looks radically different after its first year. 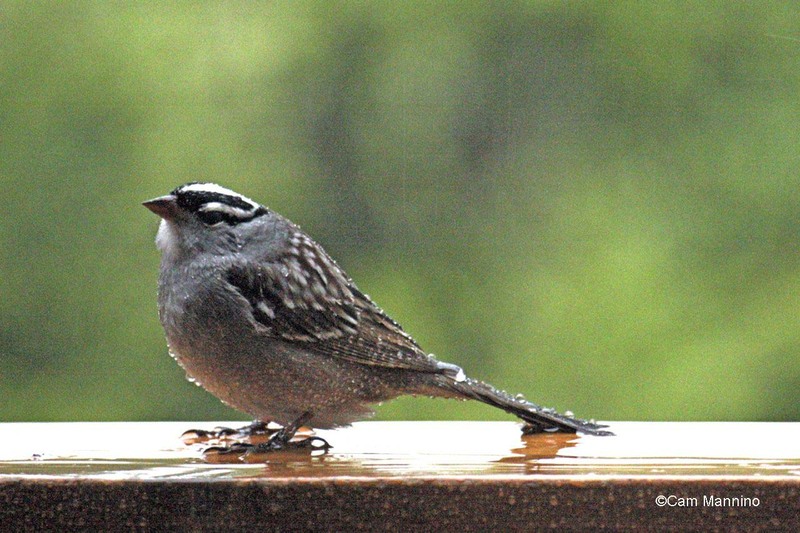 A White-Crowned Sparrow looks very different after its first year – and it breeds below the Arctic Circle! Sharp-eyed Ruth also saw two Lincoln’s Sparrows (Melospiza lincolnii ) which look very much like a Song Sparrow (Melospiza melodia) but are smaller and daintier and have no central spot on their breasts. Unlike the courser streaking on a song sparrow, the Lincoln’s Sparrow’s black streaks are finer and on “buffy” flanks. Wikipedia says they are “quite secretive” – too much so, for my eyes and camera! So here’s another Cornell link to get a look. The visiting summer sparrows that spent their summer in the park are still here too. A Field Sparrow (Spizella pusilla) with its bright white eye ring and pinkish bill and feet watches other migrants hop in the trees. 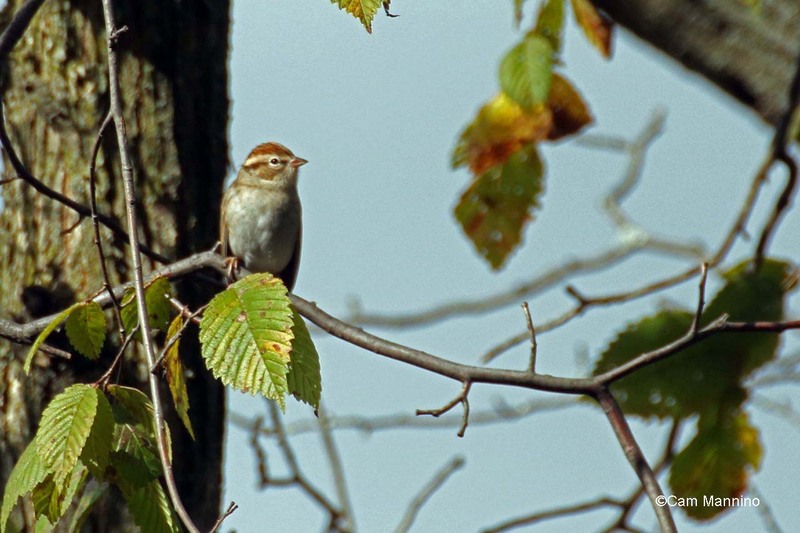 As their name implies, Field Sparrows avoid suburban areas and will soon fly off to somewhere south of Michigan so keep an eye out for them soon at places like Bear Creek! 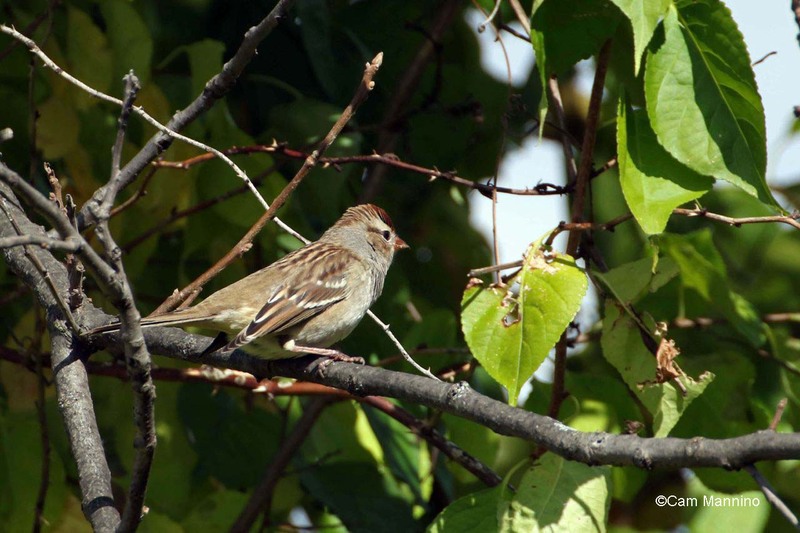 The Field Sparrow avoids suburban living so come see it in the park! It’ll migrate farther south for the winter, though it breeds here in the summer. 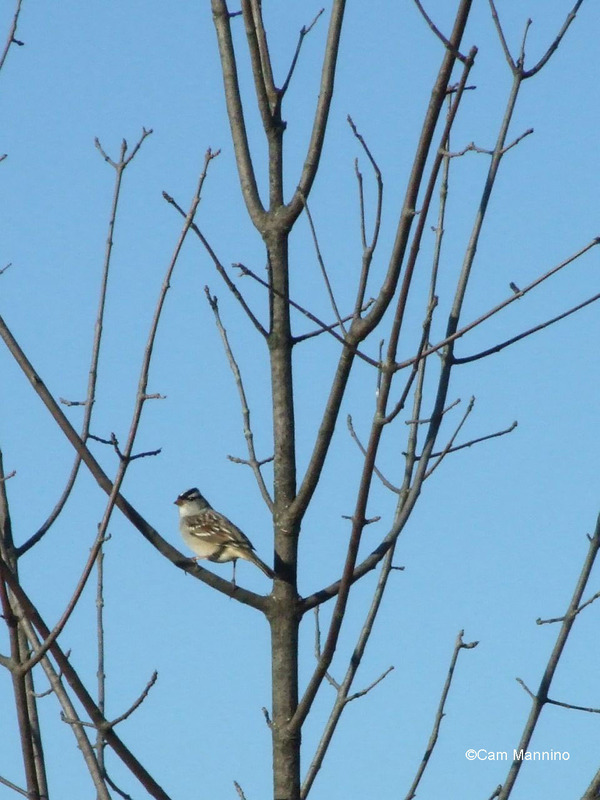 During the Wednesday bird walk, the treetops on Walnut Lane were filled with Pine Siskins (Spinus pinus). 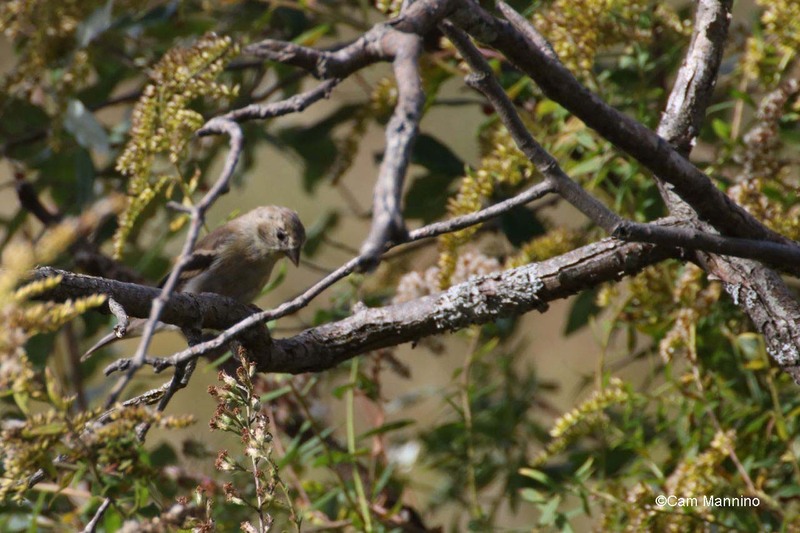 This nomadic finch appears some years and not others as it follows the best seed crops. My photo in morning sun in the treetops shows its streaky head and body but not the flashes of its subdued winter yellow as they flutter or fly, so have a look at Cornell Lab’s photo. Down at the Center Pond, we saw an Eastern Phoebe (Sayornis phoebe) darting from the shore to the water, catching a few bugs. 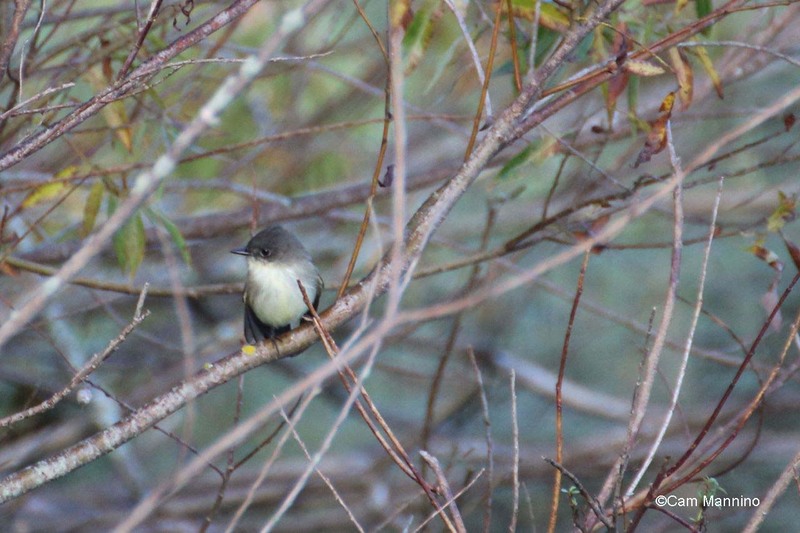 The most distinguishing field mark of a Phoebe is a constantly pumping tail, plus a dark head and white breast. The males usually sing “Phee-beee” only when courting but one was trying out its song on Wednesday. It probably spent the summer here. It will be migrating in the next couple of weeks and be gone by early November. An Eastern Phoebe flitted between the shore and water catching insects for its migration in the next week or so. At the western edge of the pond on Wednesday, deep in the brush, skulked a migrating Hermit Thrush (Catharus guttatus) who probably raised its young farther north in Michigan or Canada. 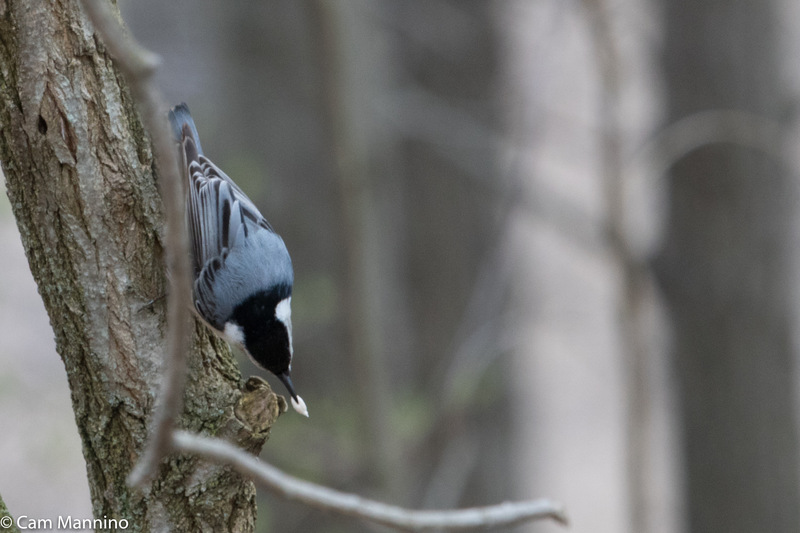 These birds rummage in leaf litter looking for insects, so they can be hard to see. But the following day, it appeared on a log near the pond. 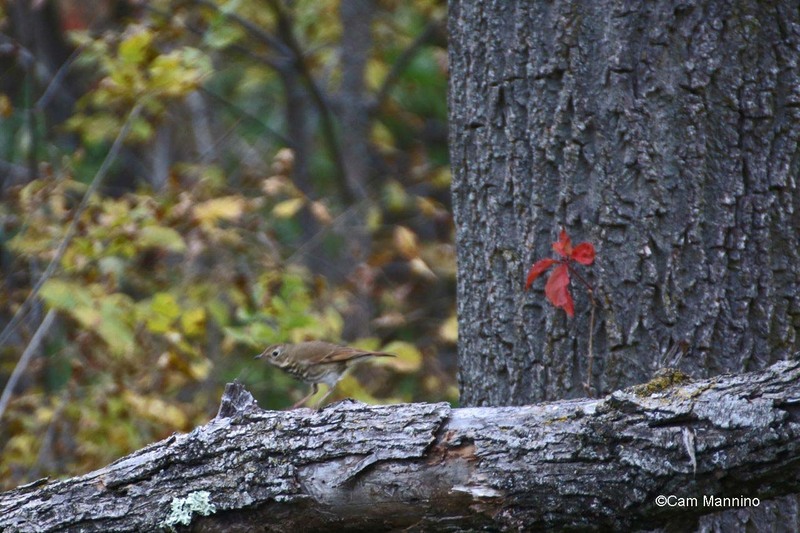 A Hermit Thrush near the Center Pond. Also at the pond, Ruth spotted a Blue-headed Vireo (Vireo solitarius) which may have spent the summer among pines farther north. It generally looks blue-gray but Ruth told us it’s more blue in direct sunlight. I love its white “spectacles.” Unfortunately, I didn’t get a shot of it but here’s the link to Cornell’s photo. 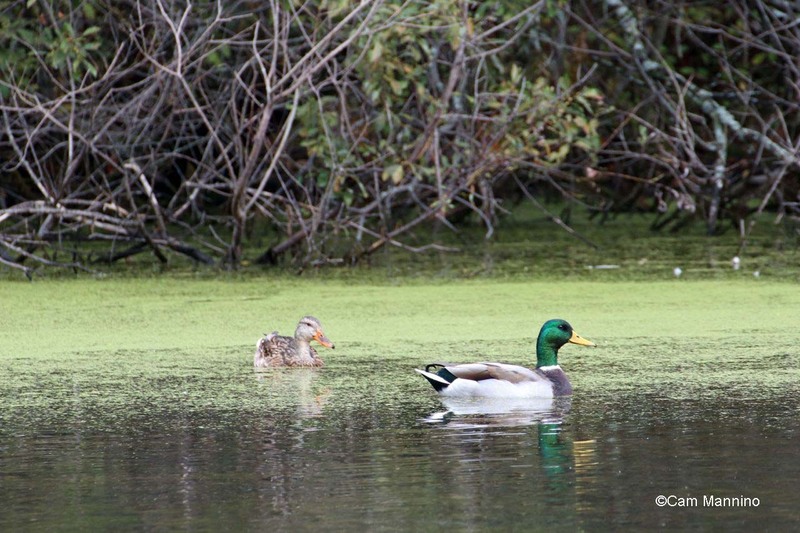 The Mallard (Anas platyrhynchos) males at the Center Pond are slowly getting rid of their eclipse plumage. Here’s one whose beautiful green head feathers have almost completely molted. This male Mallard is almost finished molting, but his iridescent green head feathers still have a little way to go. He’d probably like the molt to be over, since some of the males now have their full complement of courting plumage and are already pairing up with females, though mating won’t happen until spring! They’ll move to the Gulf Coast this winter, unless they can find an area with sufficient food and open water farther north. Some male Mallards have completed their fall molt and are pairing up with females, though mating won’t happen until spring. 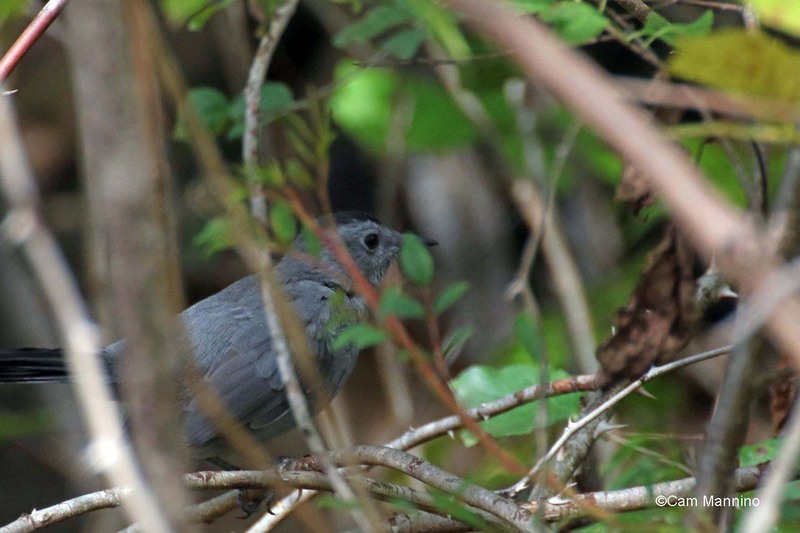 The Gray Catbird raised its young here this summer but will be leaving soon, too. This one in the vines and bushes north of the Playground Pond looks like it’s finished molting and is about ready to go. A Gray Catbird ready to fly south, as far as Florida or even Mexico, in a week or so. A flock of young Cedar Waxwings (Bombycilla cedrorum), who have left their fledgling feathers behind and now wear their first winter garb, jostled noisily among the fruiting vines and trees. Some of them may remain here for at least part of the winter and then head south. I saw a flock of Waxwings at Bear Creek eating in ice-glazed branches on Christmas Eve two years ago! Others have already left for warmer climes, sometimes as far south as Central America. These noisy young ones are identified by mottled chests, shorter crests, and a wider white lines around the mask – but the tips of their tails still glow bright yellow in sunlight like adult waxwings. A first winter Cedar Waxwing, part of a large noisy flock eating fruits from trees and vines north of the Playground Pond. This female American Goldfinch (Spinus tristis) looks a bit disconcerted about molting into her drab winter colors, much like the female Cardinal that I posted last week. This winter-ready Goldfinch, though, looked as if it enjoyed its ride on a plume of Canada Goldenrod as it picked seeds from the dried blossoms as they swayed in the wind. 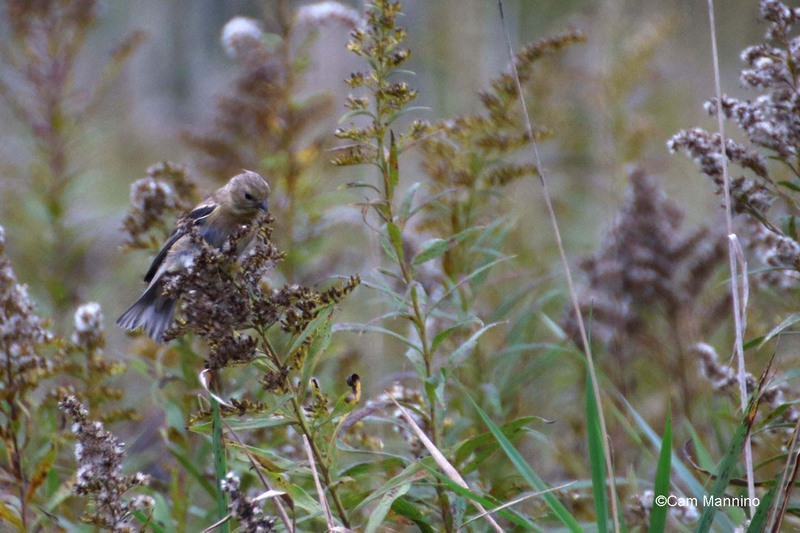 A Goldfinch in its winter garb rode a plume of Canada Goldenrod, picking off seeds as it swayed in the wind. 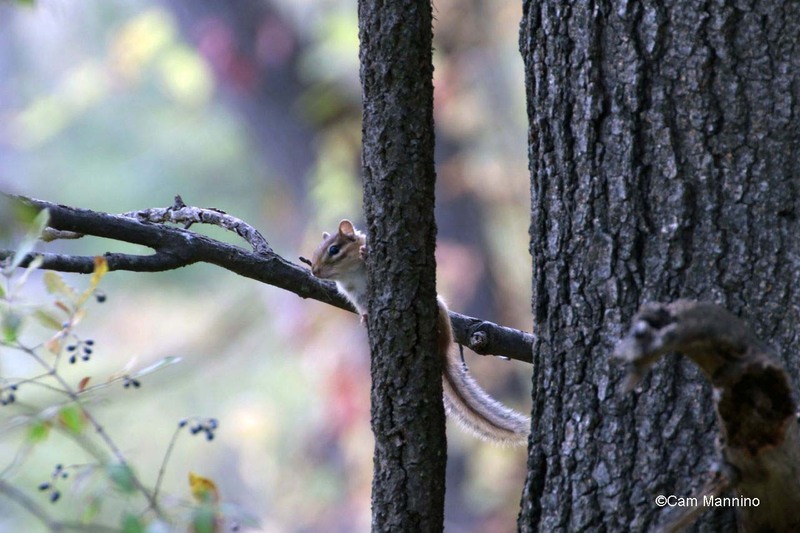 A tiny Eastern Chipmunk ((Tamias striatus) dashed up a tree near Snell Road. I love how his tail was backlit by the late afternoon sun. In the southernmost meadow near Snell, I spotted a large patch of white plants I’d never seen before. Dr. Ben identified them as Fragrant Cudweed. The University of Michigan Herbarium uses that common name or the slightly less bovine Old-Field Balsam. 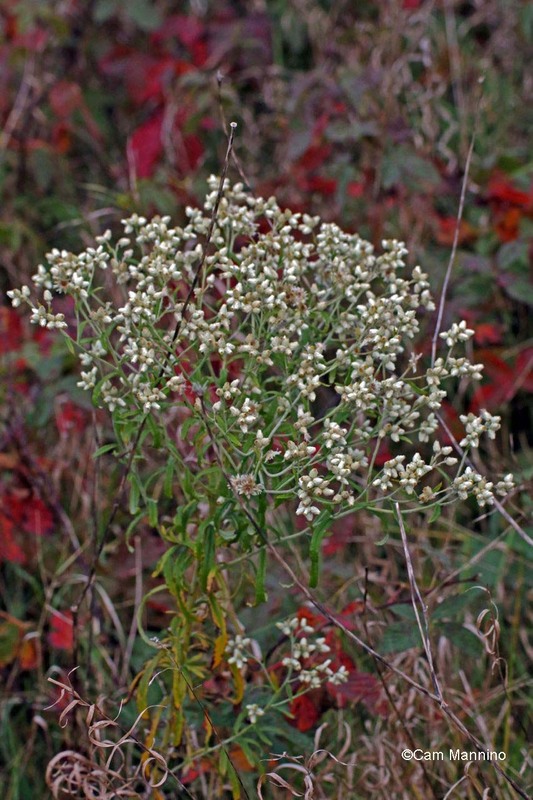 Many internet sites call it Sweet Everlasting (my fave of the three) and look at its Latin name – Pseudognaphalium obtusifolium – !! Whatever you call this native plant, it’s interesting. According to a Minnesota Wildflower site, the clusters of what look like egg-shaped buds are actually the blooms with the yellow/brown anthers (pollen- producing flower parts) exposed at the end. And what looks like whorled petals are bracts, leaflike structures which will open and fall when the seed ripens. Nice to have fresh blooms so late in the year! As the weather gets colder, we’ll really wish they were everlasting! 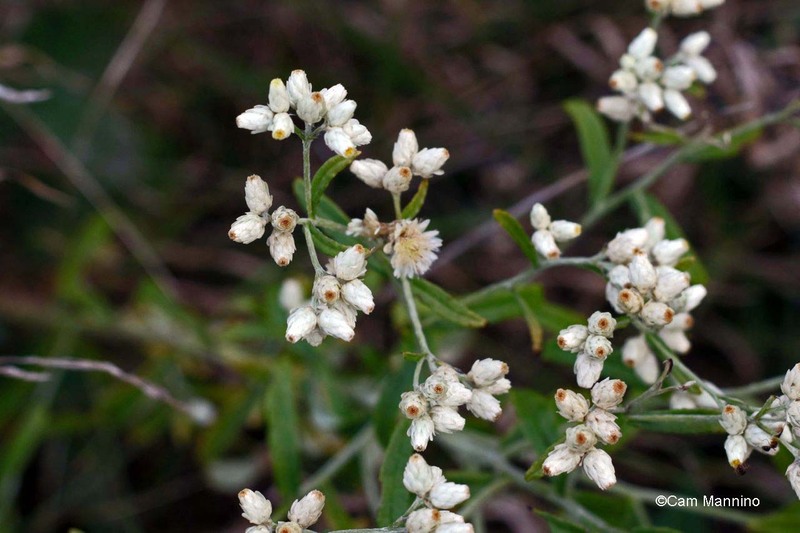 Cudweed or Sweet Everlasting blooming now in the southernmost meadow near Snell. They may look like they’re buds, but they are the egg-shaped blooms of the Cudweed or Sweet Everlasting. Fall migration must be a restless, exhausting, but exciting time for birds. Their hormones, the shorter days, and the temperature all tell them it’s time to go south. Dangers lurk along the way, which is one of the reasons perching birds travel at night, avoiding raptors who travel by day. Severe weather, a shopping mall where a woods used to be, lighted buildings that confuse the birds’ navigation systems can all be disastrous. But the pull is strong and off these small birds go in the night, riding the wind if they can. I hope you get to see some of them off.